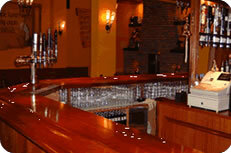 You can also enjoy a quiet drink in any of the hotels or restaurants listed on this page. 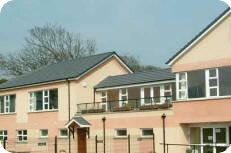 Situated right in the centre of Cushendall. Just about 50 yards down from the Glen's Hotel. More suited to a younger clientele or anyone who likes a lively time, there is a games room, with a pool table, dart board and juke box and a separate room where a weekly quizes and karaoke are held. There is a lively and friendly atmosphere and the bar is open until late! The function room upstairs often hosts singers and bands on the weekends, and is very popular with people coming from miles around. The Guinness is very good at the Lurig! Food is available from both the bar and the restaurant. 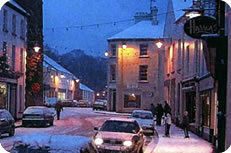 Children and parties are guaranteed a warm Co. Antrim welcome. Music lovers of all tastes are catered for with the provision of both traditional and contemporary music nights. Late night opening until 1am allows both locals and tourist to enjoy to the fullest this traditional Co. Antrim pub. If you are looking for a traditional Irish pub, this is the place to be, originally a coaching inn it still retains the character and charm from those by-gone days. It's obvious that the pub was once a typical Irish dwelling, a range in the kitchen, open fires, a central yard (which now has a roof). Often two or three of the rooms have a different group of musicians, playing traditional Irish music, or blues, or even Snow Patrol! Harry's is ideally situated in the heart of the village. You are assured a warm and friendly welcome, with good food and excellent surroundings. If you are looking to celebrate that special occasion, the upstairs restaurant offers a full a-la-carte menu and parties and groups are welcome. Snacks, and lunches are also available in the bar area with a variety of vegetarian meals also being served. The restaurant is open all year round and is popular with locals and regular visitors alike. Cushendall golf club is situated right on the beach providing spectacular views across the Sea of Moyle, to the Mull of Kintyre on the Scottish coast. It is noted for its friendly atmosphere; where the visitor is always welcome whether you want to enjoy a round of golf of just relax in the club house with a long cool drink. Bar snacks are served in the bar area or you can dine in the restaurant, whichever you choose the food will be of the highest standard and at affordable prices. The bar area has two televisions and the locals gather to watch their favorite sports. The golf club is family orientated and children are more than welcome. Seafood is the speciality of the award winning chef, and the trout is highly recommended. 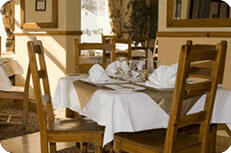 The Golf Club is very popular and calling ahead to book a table is recommended at the weekends. Upstairs at Joes is a nice restaraunt with an Irish twist. The owner and chef Pol Shields has been an All Ireland finalist in The Seafood Restaurant of the Year and was highly recommended in The British Airways Restaurant of the Year, and was awarded the UK's Best Children's Menu of The Year. Pol uses only local ingredients from the Irish sea and the Glens of Antrim to showcase his culinary skills. 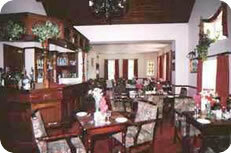 The restaurant is open for lunch and evening dinner where you can have a light snack or a three course dinner. They are open 7 days from 12 till 9pm and 10 pm during the summer. A great place for a light lunch or a quick coffee, Cafe Cova opened in 2018 and serves healthy soups, salads and sandwiches as well as hot food, hot drinks and cakes. They already have a well deserved reputation for great food and service. 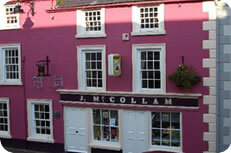 Mill Street where you are assured of a warm welcome and a hearty, healthy full Irish or continental breakfast. This is of course just Cushendall, Cushendun, Waterfoot and slightly further affield Ballycastle all have great bars and hotels that you can pop into for a meal or a quiet drink and top notch restaurants, all happy to see new or old faces.